Sometimes people with funny names become very famous. Sometimes they get so famous, so well-known around the world, their name repeated over and over again, that it becomes easy to forget how funny the name really is. Sylvester Gardenzio Stallone fits that description. For a time in the 1980s, Sylvester Stallone was arguably the biggest movie star in the world (figuratively speaking, he’s reported to measure out at only 5’10). He played muscular world-savers with few words and simple, badass names like John Rambo or Lincoln Hawk (except when he played silly characters with hilarious names like Angelo “Snaps” Provolone or Cosmo Carboni – but those weren’t as successful). Lost in all that success was the fact that the name Sylvester Gardenzio Stallone is pretty amusing. Not enough people are named Sylvester these days. Stallone himself always disliked the name and instead preferred to be called “Sly”. But it’s a good, memorable Hollywood name so he never changed it. He was born in 1946, and got the name from his hairdresser father Frank Stallone Sr. and his mother Jackie, who was an astrologer and women’s wrestling promoter, and whose maiden name was Labofish. That’s a pretty amazing set of credentials. “Sly” managed to live up to that by creating one of the most iconic and best-named characters in American movie history in Rocky Balboa, almost 36 years ago. Passing on his gifts to the future generations, Stallone has five children, Sophie Rose (pretty name), Scarlet Rose (going with the lovely plant theme), Sistine Rose (unusual but nice), Sage Stallone (herby), and Seargeoh Stallone (what?!). 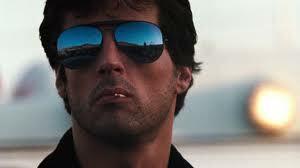 Stallone's performance in "Cobra" as the well-named Marion "Cobra" Cobretti consists mostly of this face. Classic work. Stallone holds the record for Most Razzie Award nominations, with an impressive 30 nods, “winning” 10 “awards”. He received the Boxing Writers Association’s first award for “Lifetime Cinematic Achievement”, presumably for the Rocky series, but perhaps also for a solid 40 years in film spent mostly punching people. Supposedly, Stallone is one of President George W. Bush’s two favorite actors. The other one is Chuck Norris. This explains a lot. Is the only actor in the history of Hollywood to have had movies open #1 at the box office in five consecutive decades. And that my friends, is the story of the great Sylvester Stallone. For this beautiful man-romance alone, he has earned a spot in cinema (and funny name) history. This entry was posted in Uncategorized and tagged actors, comedy, funny names, humor, movie stars, movies, stallone. Bookmark the permalink. Good ol’ Sly. I didn’t know his middle name, or that he hated his first one. The more you know, I guess. I guess it beats being called Gardy. That’s true. The only Gardy I can think of is baseball player Gardy Pena. Sly’s mom, Jackie Labofish (she later became Jackie Stallone), looked a lot like him http://www.filmweb.pl/person/Jackie+Stallone-379231 until she botched her face with horrific plastic surgeries. Wow what a middle name he has! We have never met a dog named Sylvester. It is a great middle name. Sylvester is indeed more of a cat name, I’m afraid. Meow. 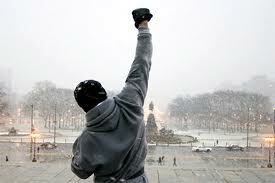 Did you know that the budget for Rocky was only 1.1 million dollars? It ended up grossing more than $250 million at the box office alone. That’s a good return on investment. Joe Frazier – who had one of the great trilogies of all time with Muhammad Ali – has a lot of similarities to Rocky Balboa. Both were Philadelphia-raised blue-collar fighters, who went up against a loud, eloquent, showy, and beloved African American heavyweight champ. Their prime skill was their toughness and ability to take punches. After Frazier won Olympic Gold in 1964, he had almost no fanfare and went back to working in a butcher shop. This is where the “investment” part comes in: an all-white group of investors formed the “Cloverlay group”, where they pitched in $250 each to buy one of 80 shares in Joe Frazier’s career, together raising $20,000 to allow Frazier to train full time. One of these investors was none other than HBO’s very own…….. Larry Merchant! However, Stallone said he was inspired to write the screenplay for Rocky after watching an unknown journeyman named Chuck Wepner come out of nowhere to go 15 rounds with Ali, just one fight after Ali had knocked out George Foreman (who most considered the best heavyweight of that era prior to that fight) in 8 rounds. Stallone wrote the screenplay in something like three days, and wouldn’t license it to anyone until they let him play the main character, rather than some established star like Steve McQueen. Thanks for liking my blog post! Yours is unexpectedly educational, love it!